These artworks are available as high quality prints on 310gsm Hahnemule paper. The printed area is approx. 200mm x 200mm (8" x 8") done with Epson inks by a Dunedin gallery. I’ve always loved Donkeys, I think because they look like a Great Dane dog crossbred with a Hare. Long jowls, long ears, big deep eyes. They look muscular and powerful, yet soft nosed and fluffy eared; cute enough to cuddle. Donkeys seem to be an intermittent recurring theme for me. The first Donkey I ever met in person was on a farm in Switzerland about 10 years ago and he was so solid looking I was actually too scared to get too close. I kicked myself later that I had been such a big chicken (but I suppose that was better than being kicked and then laughed at by a chicken). He was very interested to know who was visiting and he hung his log-like head over the fence to investigate, and he was just so beautiful. ...the Donkey at the podium, the Donkey with his head in a vice....my heart was won. Four years ago we put in an offer on a big old wooden house in Dunedin. On the lounge wall was a small painting of a Donkey. I asked the real estate agent if the vendor would sell the painting with the house (as he was leaving the country and I’m sure he wouldn’t need a Donkey would he??). The vendor said no. I decided then and there that one day I would paint my very own Donkey. March 2018 I painted my first Donkey. My Donkey stands on a drum wearing a brass band hat. He’s not tap dancing or playing percussion with a drumstick. He is unsure if he fits in the show. He thinks he ‘should’ go along with it but his heart isn’t in it and so his body stands still while his mind runs elsewhere. He is “No Show Pony”. Gold And Skullduggery – but no pirates…. 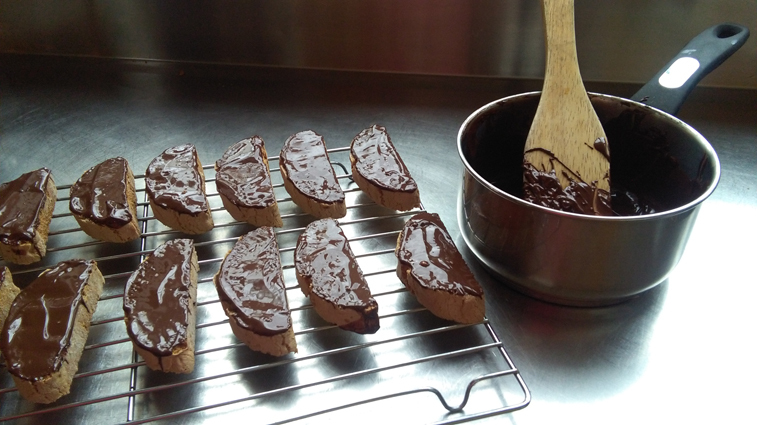 Dunedin – the capital city of New Zealand, well….er…nearly! Beginning in the 1860’s there was a gold rush in Otago and Dunedin became a bustling city of traders and bankers. Much of the historic architecture in Dunedin city has quite intricate details and ornaments, an indication of the wealth that once existed here (think Lion's heads, King Neptune, eagles etc) cast in plaster on the frontages of hotels and banks). 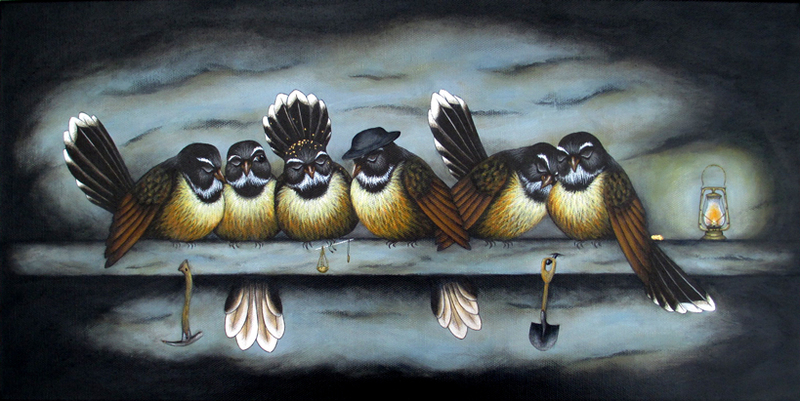 As part of my “One Winter’s Night In The Woodshed” series I decided to paint a tribute to the gold miners. It was all hard labour in those days and they wore wide brimmed hats to keep the sun off their faces while they toiled with pick axes and shovels. ...and is he actually ASLEEP? His neighbour doesn’t seem too impressed about his sideways lean. ... that noone else has seemed to notice. I like to do little project studies for my art to find specific information, and so I go looking through museums and in library books and Google random bits of information. Thanks to great displays at Toitu Early Settlers Museum and Otago Museum I was able to see old lanterns, picks, shovels, lanterns and crumpled up hats to paint from. 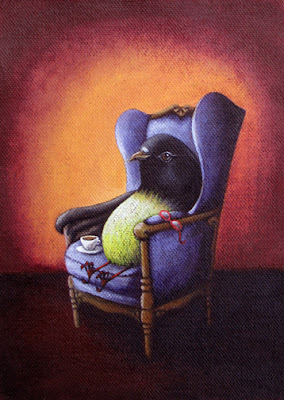 I hope you all have the chance to slow down this Christmas, to sit on a comfortable perch with your cup of tea and daydream a while. Thanks to everyone who has joined me on my feathered flights this year! All the best for 2018! A time for reflection - from the naughty seat? ... (a statement uttered by many a provincial man in Aotearoa at this time of year). Some birds are large and graceful in flight, some are slender with long curved beaks to pull nectar from deep flowers. 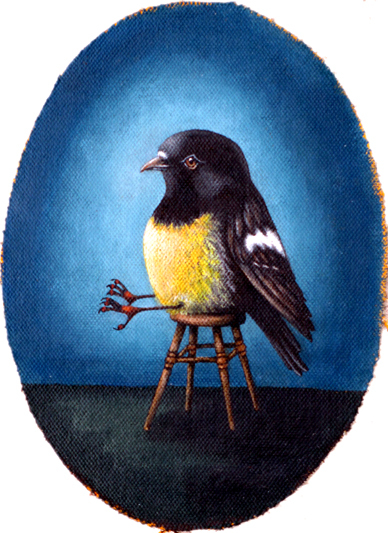 The bird I have fallen for has a rotund puku (tummy), a tail which was an afterthought and toothpick legs. ...and he is sitting patiently waiting for someone to take him home for Christmas. Do you have spare christmas pudding for a wee bird at your house? 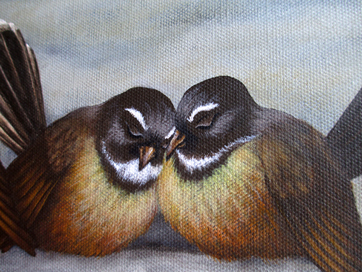 The Piwakawaka (fantails) are having a hard time staying awake...its such a busy time of year! We've been having summer weather down in Dunedin throughout November (probably means it will snow on Christmas day - it has once, seriously). This time of year always seems to go so fast and Im in the studio working on paintings for December and February deadlines - will give you sneaky peeks soon! I'm off to a slow start this morning - feeling 100 years old. For a week I've been trying to coax my 3 year old son into being a sailor or a pirate for his kindy dress up day today - stripey shirt, ragged shorts - easy for mum. 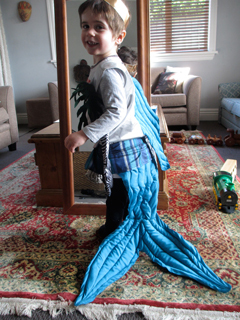 But no, he has been adamant for the entire week that he absolutely must be a Mermaid. We have no Mermaid things at our house. So, 6pm lastnight out comes the bag of fabric scraps... blue satin lining from an old skirt I had, a silver tank top I never had the courage to wear in public, green felt left over from gluing felt squares on the feet of my dining table chairs,....then I sew til midnight and this morning the son of an artist (alias slow tired tortoise mother) is an ecstatic Mermaid, and I mean crazy happy. Coffee and cake will hopefully give me the zing I need to power through my work today (any excuse!). An angel (you know who you are) left that wee birdy coffee cup as a gift on my front gate one evening - really love it!! A Portly Clumsy Drunk Paua Shell? The Great Kereru Count of 2017 recently took place and to do my bit for the feathered fraternity I looked to the skies trying to locate our local Kererus. ...driving the car looking up at the power lines, and falling of the edge of footpaths gazing into tall trees and pockets of native bush as I walked. The risks involved were worth it because this bird is really lovely. 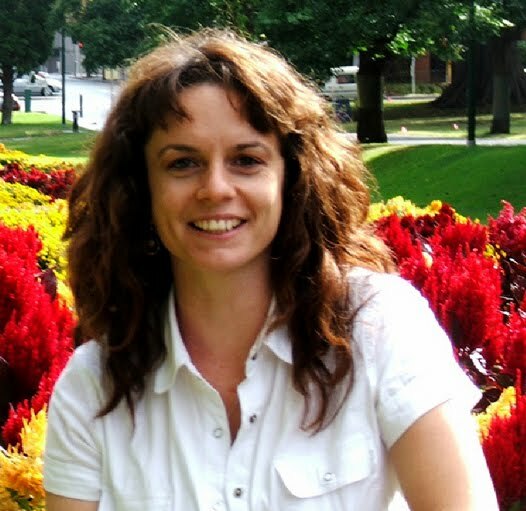 I never knew much about Kereru before I moved to Otago, and in having them around constantly I've developed a fascination with them. - About the size of a Size20 frozen chook, the Kereru defies the odds in a way similar to a DHC4 Caribou aeroplane in that it looks like it shouldn't be able to fly because it is so...um..."portly". 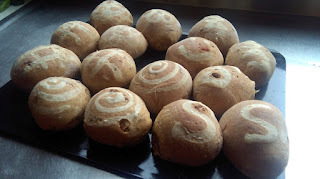 - They always remind me of a portly matron or a nun with its blazing white bib ...but they also have a very small head. ... and feet for many years. When I get to see the display flight used in mating rituals I just stand and grin like an idiot because its so graceful. 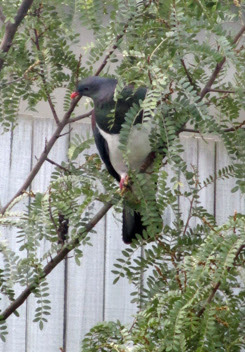 - The noise made by a Kereru beating its wings is really loud; its the first thing that alerts you to its arrival. If you're not used to the noise you automatically duck expecting some giant bird of prey to swoop down and lift you off the ground by its talons. ...and fall out of trees drunk as skunks. 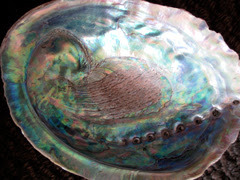 - To my eyes the Kereru feather colours are a deeper, more saturated version of Paua shell colours. Just gorgeous!! 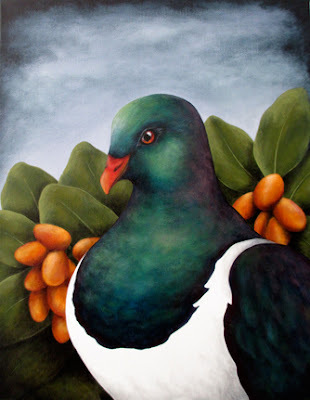 I have done so many paintings of the Kereru...and so why not one more!! One of the trees they eat berries from (which result in much silliness and stupor) is the Karaka tree whose berries begin green and ripen through to lovely orange and yellow colours. I really wanted to capture the lush colours of the Kereru's plumage with the vibrant colours of the Karaka tree berries. 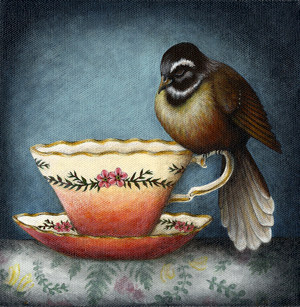 Where it all started.... "Manuka Slumber" was the first bird I’d painted on a tea cup. I'd heard the saying "A cup of tea and a lie down" so I thought I would paint a wee Fantail perched on a tea cup having a wee nap. I had no idea where the saying came from but good old Wikipedia informs me it was actually part of an Australian advertising campaign for a medicinal product containing aspirin, phenacetin and caffeine; a 'mothers little helper pill'. 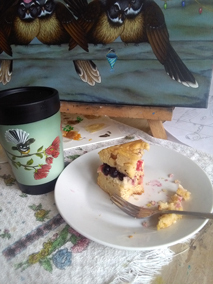 I had wanted to paint a cup that was beautifully coloured and uniquely New Zealand so I adorned it with the leaves and flowers of the Manuka. As kids our weekday tablecloth at home was a heavy cotton floral one featuring Kowhai, Kaka Beak and other NZ flowers. I found one of these in an Op Shop oneday and snaffled it up in a hurry! for $45 each plus P&P. 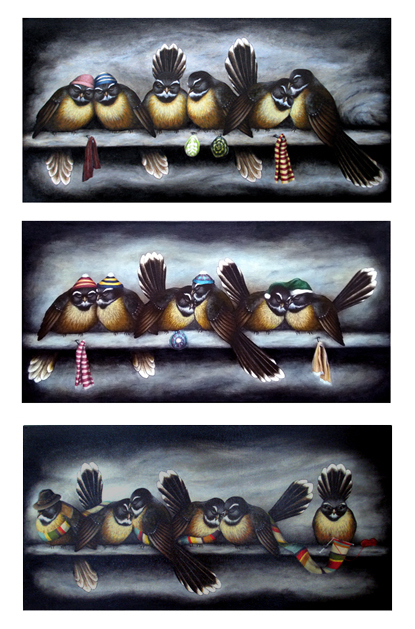 Print measures 200mm x 200mm and is titled and signed by the artist. 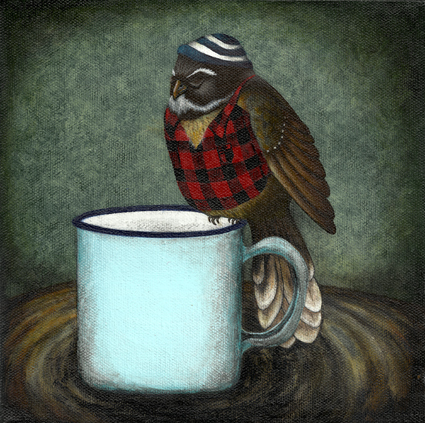 The woodcutter is the quintessential kiwi bloke in his 'swanny' and favourite woolly hat, perched on one of those old blue enamelled tin cups many of us had (and still have!) for camping trips or days outdoors. To me this fantail is the Uncle, the Dad, the guy next door, who every year spends a few days chopping, sorting and stacking firewood ready for the winter. Big burly blokes with little skinny legs who wield axes and tomahawks like the men of a bygone era. At the end of a hard days work doing firewood its time for a wee kip in the late afternoon sun…or snoring in the lounge chair halfway through the TV news! Oh look! there’s Grandad at the kitchen table in his tweed cheesecutter hat having a wee snooze after his umpteenth cup of tea. 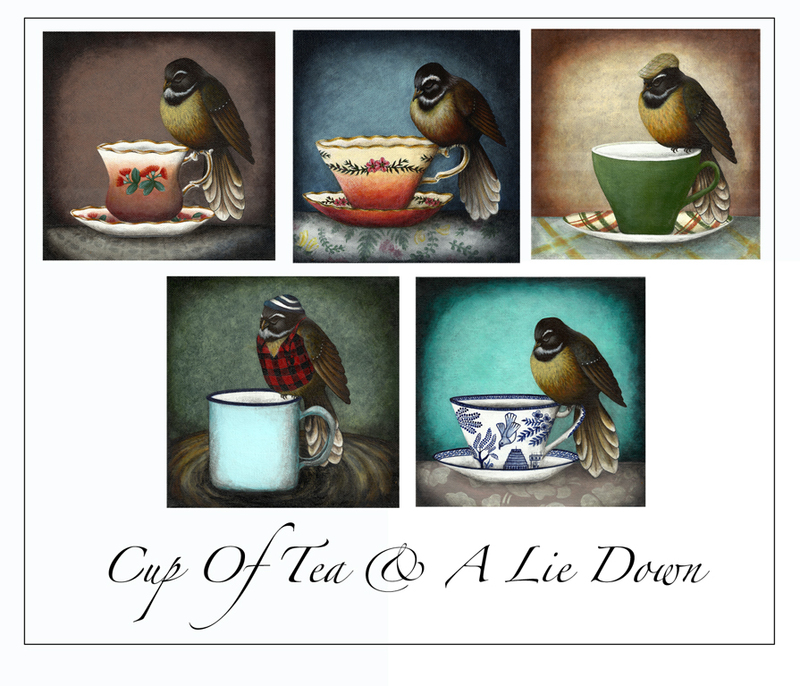 Man, the cups of tea! 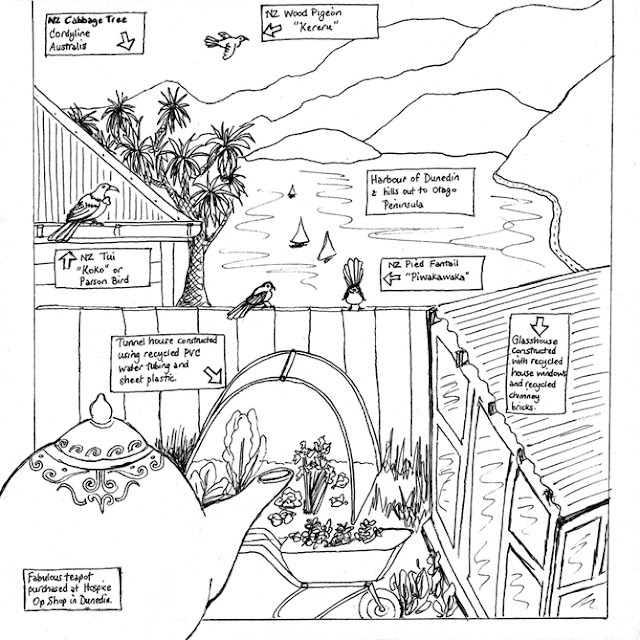 It wasn’t abnormal to be given 8 cups of tea a day at my Uncle’s place, in crockery which was an assortment of Crown Lynn patterns and considered the precious things of the household. 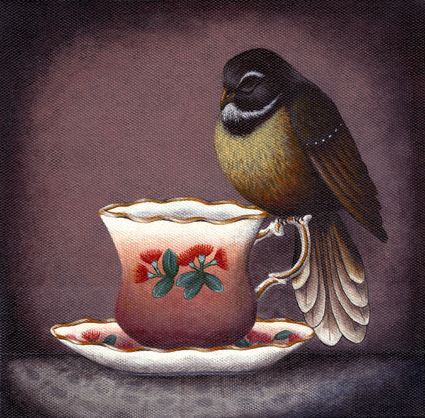 This wee snoring Fantail (Piwakawaka) perches on the side of an original Kiwi rendition of the Blue Willow tea sets so many of us grew up with. Instead of the very oriental themed images on the Blue Willow cup, “Blue Wellie” has icons of Wellington NZ – the Beehive and Parliament Buildings. A Kereru swoops in the air above Kowhai trees and Manuka flowers. Remember those shimmery silky tablecloths with the floral print? If anyone spilt something greasy (think 1970’s roast meat gravy) Mum would shoot you a look that could kill! The Blue Willow tea set only ever came out on special occasions and as a kid you knew that the likelihood of cake was very high on those days. 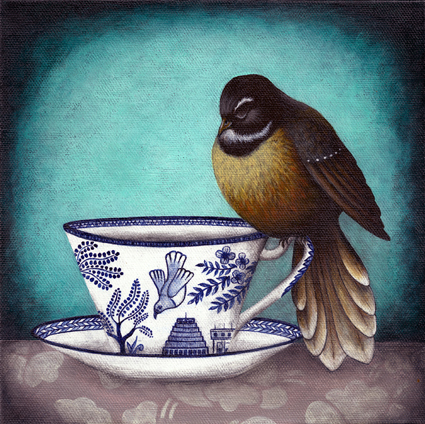 This little Fantail (Piwakawaka) is quite demure with her tiny feet clutching the delicate cup handle gracefully as she nods off (one too many cakes perhaps?). This shape of tea cup was traditionally painted with old fashioned roses on it but I wanted to make a more Kiwi version of it so I painted it with bright Pohutukawa flowers. Where did August and September go? ...and why is everyone already using the big scary "C" word (and I saw christmas lights for sale at Bunnings the other day - Stop!!). 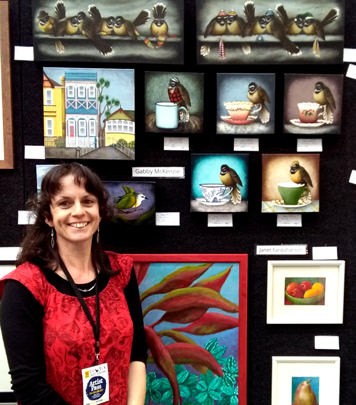 I've been flat out painting the past few weeks and took part in the first ever "Dunedin Art Show" along with my fellow artists from the Otago Art Society. 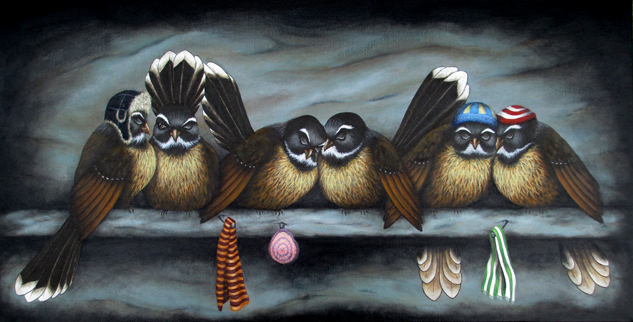 Apparently it is only Fantails/Piwakawaka that have this habit of huddling together. "Winter's Cozy Cuddle Up" is a couple snuggling together getting a dubious look from their neighbour...maybe because of the snuggling, or maybe because you're not supposed to wear your hat to bed. 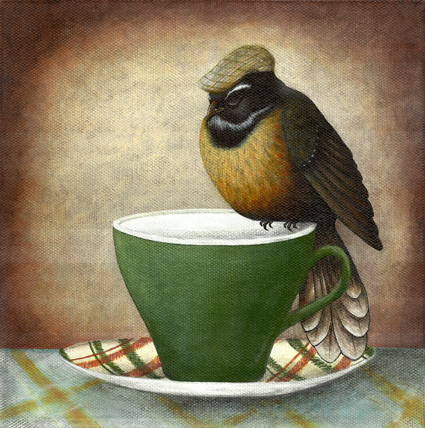 "Piwakawaka Pom Poms" was a bit of fun with hats; incorporating local rugby team colours and Edinburgh tartan...and a historical pointy nightcap in gorgeous green. 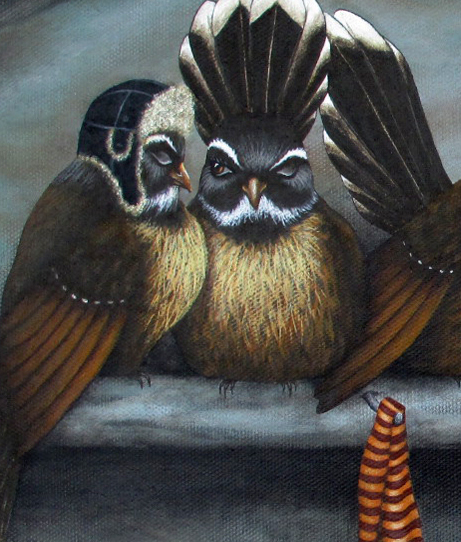 "Knitting For The Nesters" is an idea I had that all of the birds could share one enormous scarf...and in this case no ordinary scarf....for at the far left is Dr Who (Tom Baker era of the 70's) who owns that scarf. Ahhh the good old days, when robots on TV were made out of cardboard boxes!! 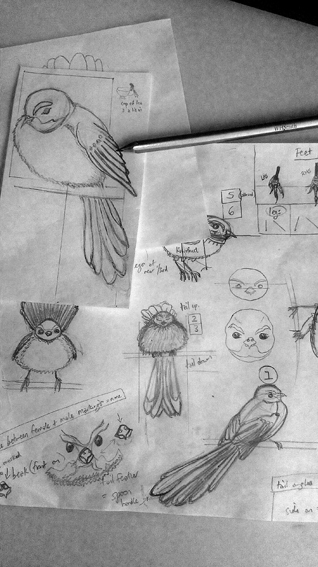 While doing the sketches for the fantail painting "One Winters Night In The Woodshed" I got hooked on the idea of cute sleepy little Piwakawaka's perching all over the place. The saying has since been used in all sorts of situations like famous quotes by Australian politicians and its the title of an album by NZ band the Able Tasmans too. 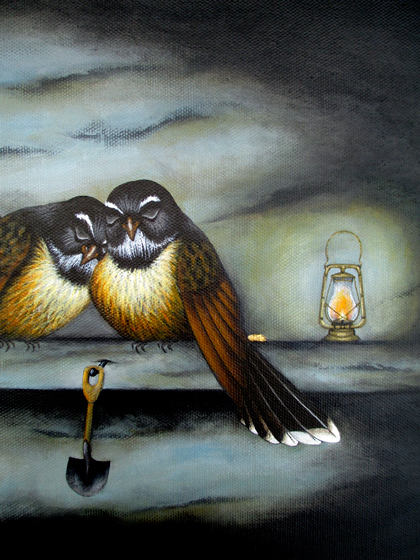 And so tomorrow I begin another sleepy Fantail painting...this time an outdoorsy type...will let you know how that goes! One of the really cool things about the internet is how it can connect us to people and events all around the world. A group in Vancouver Canada are running a project called "The Big Picture"where they take drawings from all over the world and make one large picture out of it. ....maybe Im just nosey HA! 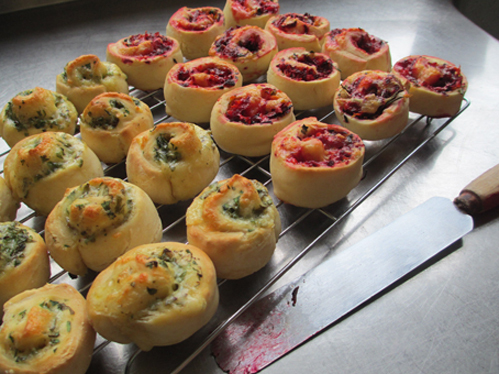 Only one month of winter left in the southern hemisphere...one more month of comfort food and hibernating. "how cute would that look!". 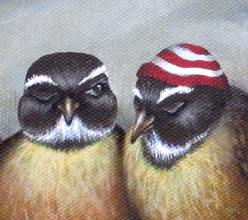 Of course it gets really really cold down in Otago so Im sure the Piwakawaka wear woolly hats and scarves too....or at least these ones do! This painting is headed for the gallery at the Dunedin Railway Station for the annual Edinburgh Realty Art Awards opening early August. It snowed overnight in Dunedin blanketing everything in shiny white. I love it when it snows, it makes everything glint in the winter sun looking so serene. 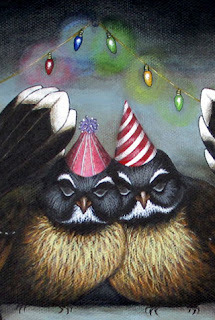 While its so cold spare a thought for our birdy friends and put out some seeds or fruit. You know food is getting scarce for birds when a giant Kereru lands in your young twiggy kowhai tree to chomp off the young leaves. I really thought he was going to snap the branches off. Work In Progress...still a few feather spots to do....and feet! Flyers need feet! 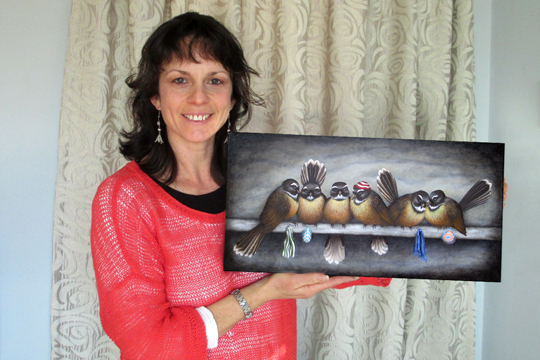 These gorgeous birds have so many different colours in their feathers that I lost count of the tints on my palette. Because my favourite colour is orange I just love the russet coloured feathers that are very dominant in the female bird. When tweeting gets you in serious trouble! Well winter certainly has arrived in the south of the South Island. The mercury drops pretty quickly mid-afternoon and my latest muse arrives in the garden. My current bird inspiration is the Fantail "Piwakawaka". Their high pitched little tweet is very endearing as they flit about on a crazy loopy flight path. According to Maori mythology this cheeky laughing tweeter woke Hine-nui-te-po (the goddess of death) who then caught Maui in the act of trying to eradicate death for humanity. 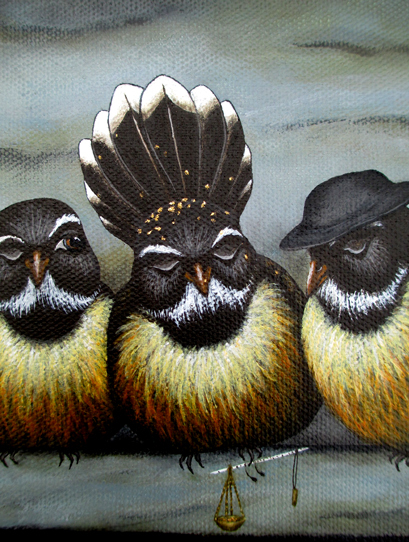 ...but probably forgave the Fantail coz he was so cute....or not, he was up to some serious business. "This is going to be SO cool"
"Sh*t I can't do this, this looks like crap"
"Surely we have some chocolate in this bl**dy house!??" "Awwww aren't yooou bewwwdifuuuul little birdy!" A few times I've been standing on the back lawn and a Fantail has danced around my head tweeting right in my face within reach. I've asked it to land on my arm but it just flies around and around tweeting at me very loudly. It's a really lovely exchange and I was wondering if it was some sort of earthly spiritual connection until a friend told me that when I walk I stir up midges and insects so it would be following me for food. I have been demoted from "Earth Mother at peace with all creatures" to "Bird Food Rouser", Ha! Well I'll let you know how I get on with this fantail painting project :) Meantime, remember its winter and the birds in your garden really appreciate a few seeds and birdy treats to get them through. 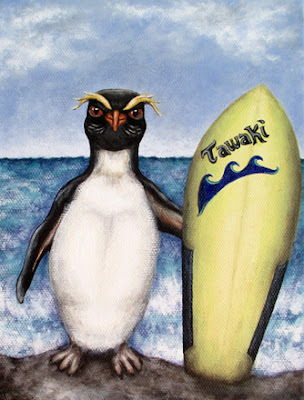 Just finished this wee chap "Westie"the Fiordland Crested Penguin also formally known as 'Tawaki' in Aotearoa NZ. His bleach blonde head stripes reminded me so much of the surfie guys with their unruly sun-bleached hair. Just like a surfer Westie is awesome navigating the surf around the western coastline of the South Island. 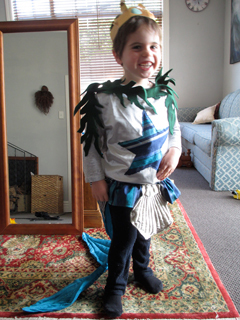 He doesnt really need a surfboard as his big shiny white puku (tummy) is great for surfing on. WANT TO BUY ART? Let's talk!